Gas ovens, in contrast to their electrical counterparts, heat their interiors using a steady supply of ignited gas. In most gas ovens, the majority of heat comes courtesy of a single burner that’s at the bottom of the compartment. Usually, you won’t be able to see this flame, as it’ll be shielded behind a sheet of metal with vents to allow airflow. The heat from this source will radiate upward into the main compartment. Why Choose a Gas Oven? Gas can very quickly produce very intense heat. That means it can reach temperature fast – though the temperature won’t be as stable as it might be in an equivalent, fan-powered electric oven. A gas oven will need to be connected to your gas supply. They’ll also need electricity in order to provide the initial ignition spark, and any timer functions you might need. The latter functions don’t require the amount of power that an electric oven might draw, and so hardwiring isn’t always necessary. When it comes to gas, however, you’ll need a Gas Safe registered engineer to fit the oven. A gas oven will need a supply of oxygen if the fire is to be kept safely lit. This means it’ll need a means of both taking in air and expelling it. Usually, cold air is drawn in from the bottom of the oven before being expelled at the back – either out of a wall or upwards and into the room. One of the crowning virtues of a gas oven compared to an electric one is that it will achieve a workable temperature in a matter of moments. So how do you know when a gas oven has reached the right temperature? Traditionally, you’d need to use an oven thermometer. These devices are still hugely useful when it comes to precise readings at different levels of your oven, and for diagnosing faults. Modern gas ovens, however, come with built-in temperature controls which will alert you when the desired temperature has been reached. If you live in an area where there are frequent power outages, then you might be tempted by a gas oven – but electricity is still required when we’re operating a gas oven, as we need a means of igniting the gas. In the case of a gas stove, it might be easy to ignite the gas using a match – but with an oven, things aren’t quite so simple. Physically accessing the rear of the oven, where the burner is, is usually quite tricky. Moreover, many modern gas ovens will turn the gas supply off intermittently during cooking, meaning that you would need to constantly re-light the fire. Paired with a suitably uninterruptable power supply, a gas oven might provide protection against power outages – but it shouldn’t be considered a magic bullet. How Efficient and Effective are Gas Ovens? While electric ovens, on average, are marginally more efficient than their gas-powered counterparts, this disadvantage is more than offset by the fact that gas is far cheaper than electricity. According to Confused about Energy, Gas hob-and-oven combinations cost around £35 every year to run, £21 less than their electric-oven counterparts, and £49 less than their electric-hob-and-oven rivals. For those looking to save money, a gas oven may be a wiser investment in the long run – even if it means spending considerably more on the oven itself. 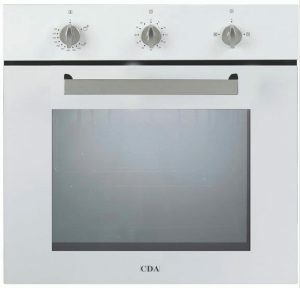 Many gas-oven owners complain that their oven does not cook evenly – and this is usually due to a lack of air circulation within a fan-less compartment. The result of this is that the oven will get hotter at the top of the oven, as all of the hot air will rise to the top (despite the fact that the burner is usually located at the bottom). That said, many modern gas ovens do come with fans – with the flame being shielded in a special compartment – and so this apparent disadvantage is slowly being consigned to history. Owners of fanless gas ovens can still guard against uneven cooking, however – by placing food on the middle shelf of an oven, and rotating it at regular intervals throughout the cook. A pizza stone might also help to guard against the dangers of uneven cooking – they act like a heatsink, absorbing heat energy and then gradually dispersing it as they cool. They’re great not just for cooking pizza, but for other foods, too – provided that they’re placed on a separate shelf to delicate foods that burn easily. 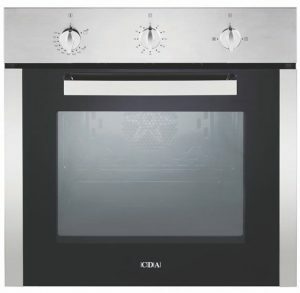 Expert advice available on our fantastic range of ovens. In stock for free & fast delivery when you buy online today! Carbon monoxide (CO) is a hugely poisonous gas that is created when natural gas is burned. When there is plenty of oxygen available, the far less poisonous carbon dioxide (CO2) will be produced instead. When burning occurs in this way, far less heat is produced – and so it’s inefficient as well as unsafe. 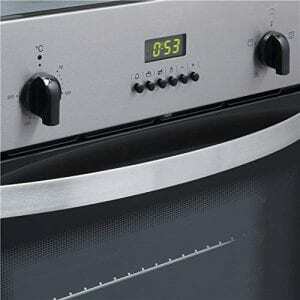 Consequently, ensuring adequate airflow around your oven is essential to ensuring that the oven can breathe. Invest in a cooker hood or failing that, at least open a window. It’s also worth fitting a carbon monoxide alarm in your kitchen. When handling the items that come out of your oven, and touching the door, you’ll want to use oven gloves. Fortunately, the glass surface of a modern gas oven will typically be double or triple-glazed, ensuring that your fingers (and those of any children in the house) won’t be burned if they should put them on the window. You’ll also want to ensure that you turn your oven off after you’ve finished using it. While modern ovens boast features to help guard against a house fire, vigilance will reduce the likelihood of one occurring to nil.